Have your dearest friend over for dinner and enjoy conversation as you both relax in this classic Chair. Padded generously and covered with gray fabric upholstery, this chair is highlighted by its contemporary demi wing back design and nail head trim accents. Made from solid wood in a light oak brown finish, the wooden legs of this chair creates an appealing contrast. Whether used at the ends of a formal dining table, or around a smaller wooden table for a contemporary touch, this Dining Side Chair is a stunning seating option for your dining space. Note: Includes one dining side chair only. Consist of one chair only. The chair features demi-wing back design and is accented with nail head trim. Upholstered in linen like fabric, this chair rests upon wooden legs. 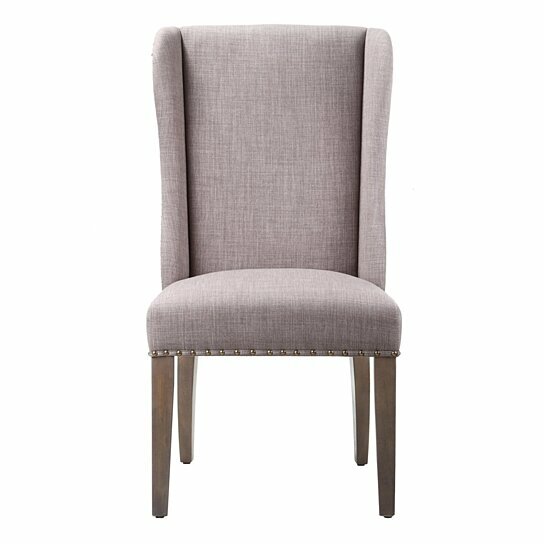 This side chair will lend a contemporary touch to your dining room or den ensemble.